The Avengers go west once again - but these ain’t your daddy’s Whackos! A bold new era begins for the mightiest heroes to ever live on the Pacific Coast. That means Hawkeye (your favorite one, Kate Bishop)! Hawkeye (the other one, Clint Barton)! America Chavez! Kid Omega! Gwenpool! And a guy named Fuse! Wait, what? 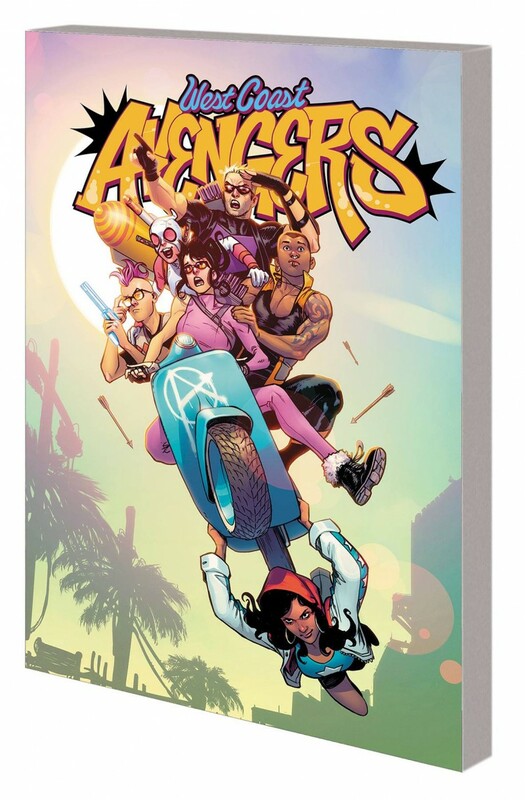 That’s right, these are the new West Coast Avengers. And you better hope they can figure out how to save the world, and fast - because big things are headed for their part of the planet! Including the attack of the 50-foot were-woman - better known as original WCA member Tigra - plus more B-movie, monster-sized threats! The West Coast Avengers are back, and California’s super villains aren’t happy - and in a not-so-amusing amusement park, they’re going to make their feelings known!